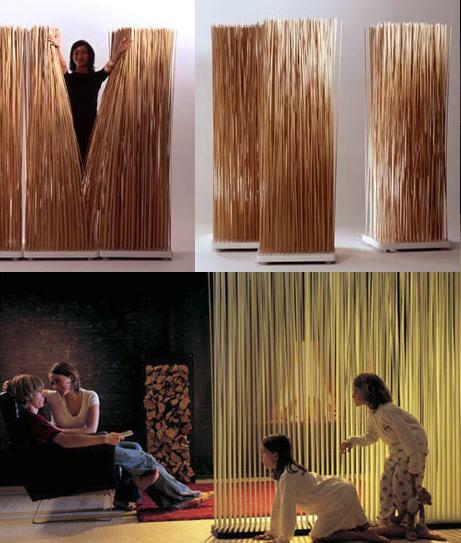 String Curtain or Panel Trac by ADO Cordon is a lightweight yet dramatic solution to dividing spaces while still allowing light and conversation to flow through the strands. Available in a variety of colors and lengths, this is one of the most appealing ways to divide up a room in both large and small spaces. 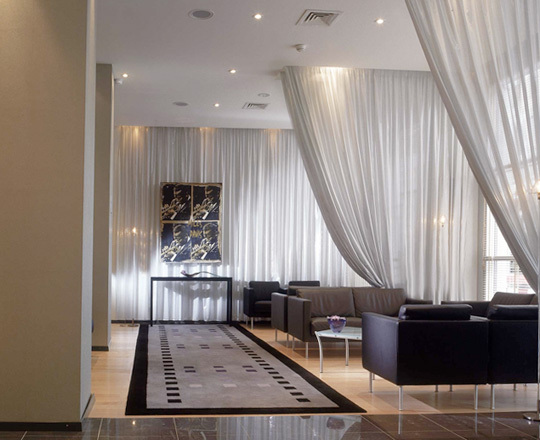 The string panels are fastened to a ceiling track in either linear or curved shapes depending on the desired effect. More affordable ‘stock’ String Curtain panels can be found online for the DIY consumer. The IVY bookcase is open on both sides to allow openness in a small space while offering separation of the foyer from the living room areas. Full height bookcases such as this are great for foyers or areas with higher ceilings. Half height bookcases or low partitions will keep a view open to window vistas or an open sight line to “must see” artwork. 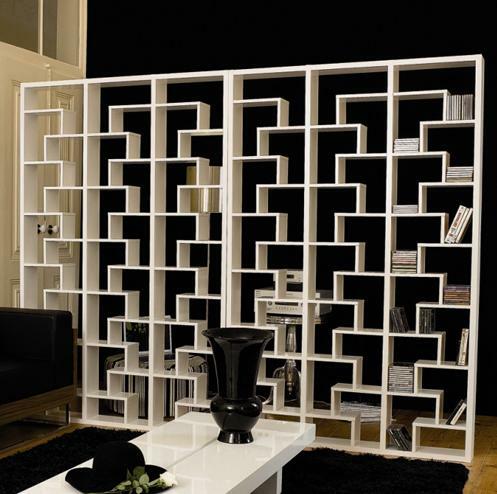 Another perk for the bookcase solution is the added benefit of storage along with a stylish geometric display. Maximizing the use of furniture by defining one room from another is a dual purpose design slam dunk. 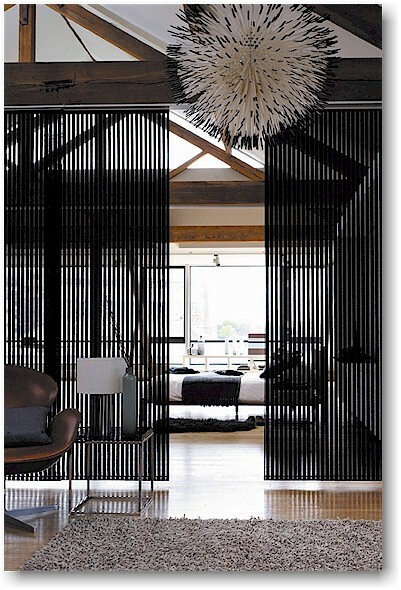 Porada metal chain room partitions are a movable piece of furniture with sculptural appeal. Historically referred to as “fly screen” to keep insects out while allowing airflow in, these chain screens can be hung within a track or on a metal, wood or resin frame for portability. For those of you who prefer the sculptural over the functional, this freestanding portal will take you into another… room. “Panel Track Systems” are a sleek room dividing option. These panels were originally developed as sliding window treatments to the alternative vertical blinds of the past. Designers and architects began using them as room dividers and most manufacturers caught on and began promoting them as such with new and improved styles. This system works with narrow panels that can stack to one side or both. The panels glide on an aluminum track and have weight bars in the lower hem for ease of mobility and vertical alignment. The panel fabric options include roller shade material, woven wood and grasscloth. Fabric is most commonly used material to offer visual privacy. We are most accustomed to seeing fabrics as window treatments, dressing room curtains, and theatrical drapery. By bringing the drapery to the interior space is yet another use for partitioning off rooms in either translucent or opaque materials. Fixed drapery would remain stationary, or it could be partially tied back as illustrated above, but by adding draw strings or a motorized track one could easily reopen or close a room by pulling a cord or pushing a button. Considering the infinite options of fabric from sheers to plush velvets there is the perfect solution for every room requiring separation. These wall alternative sticks by Globalhaus bring a natural element to a space and are flexible in both material and in portability. Although total privacy is not maintained with these solutions, they still lend a buffer between two spaces. These sticks can be purchased in small or large clusters and can be space apart if additional walkways are required. Howkins Sscreens and Lights room dividers are laser cut panels fastened together to create a separation of space without compromising style. These panels can be custom sized and designed in a variety of materials depending on indoor or outdoor uses, such as powder coated aluminum, polypropylene, PVC foam or painted MDF. These panels can be used in place of doors, walls, staircase enclosures, sliding screens, upper transoms or side lights. 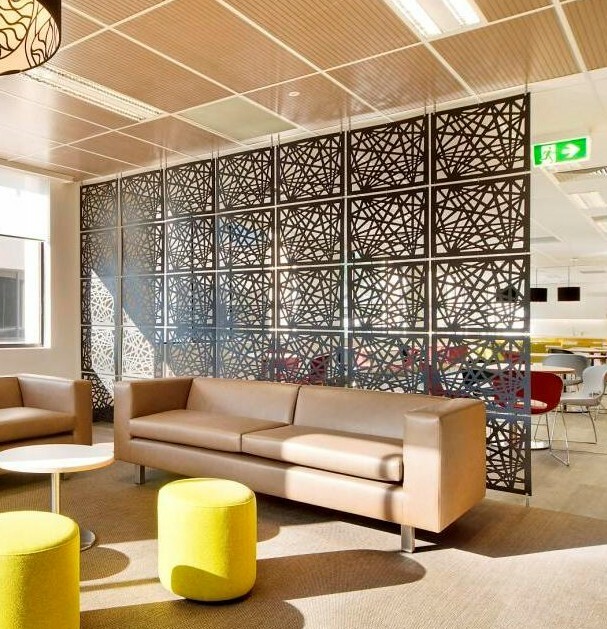 Their pierced designs offer partial privacy while allowing natural light to cast its way through the screen resulting in beautiful patterned shadows.